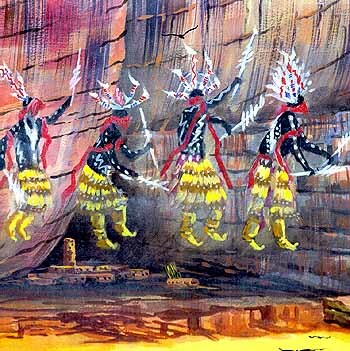 Verde Valley Ancestral Spiritual Beings Painting by Yavapai-Apache Elder from the 1100 – 1400 AD cliff-dwelling time of the Ancestral Puebloan People in the Verde Valley. This portrays an ancestral time in the Verde Valley, Arizona when the Holy Ones were here on earth–they were supernaturals who could float in the air. I was fascinated by this painting I purchased from Mr. Sine many years ago. Mr. Sine says these supernaturals taught his ancestors about religion and healing and then left this earth by walking over a rainbow bridge into another world. They way the spiritual ones are dressed is similar to today’s Apache crown dancers. According to archaeologists the Yavapai and Apache people who live here today are not the same people who created the Puebloan culture. The Puebloans were primarily farmers while the Yavapai and Apache were primarily hunter and gatherers. But this is a good example of how over the centuries, much cultural sharing has occurred. By 1450 A.D. they were gone from this Verde Valley (where Sedona is located)–the prehistoric cliff dwellings and village sites of the Colorado Plateau were abandoned by 1300 A.D.
Today’s Hopi people (12 villages in Arizona ) and New Mexico pueblo people (18 pueblos) are the descendants of these ancestral pueblo people (formerly called by archaeologists as the “Anasazi”).